Daphne plants tend to be very tempermental about regular watering in warm climates. Most Daphnes are best suited for growing in the Pacific Northwest. All parts of a Daphne plant are poisonous, especially the berries! Rose Daphne is a low growing evergreen shrub that produces its main flush of fragrant blooms in the spring and will often produce more flowers throughout the summer months. 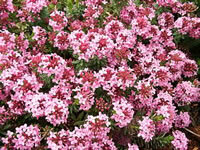 This small shrub is excellent as a ground cover, rock garden plant, growing in containers or as a foreground planting. 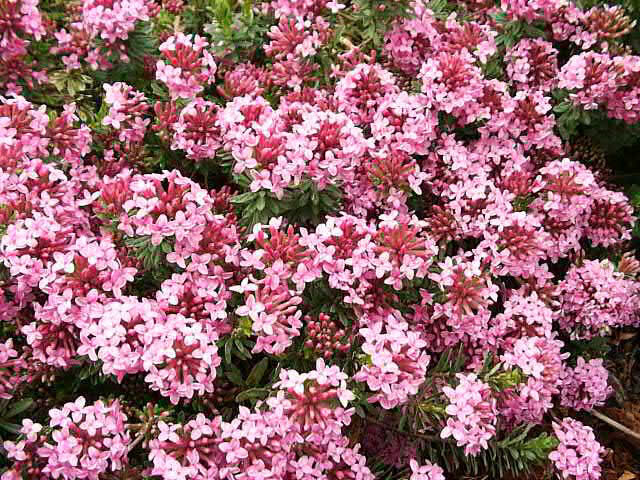 Rose Daphne plants will grow to a height of one foot, with a 2-3 foot spread. Daphne cneorum 'alba' is a smaller (6" tall) variety that produces white flowers. Rose Daphne is hardy in USDA zones 4-8. It should be grown where it will receive full sun in cool summer regions, but should receive light or partial shade in warmer areas. They should be planted in humus rich, moist, fast draining, gritty soil with a near neutral pH of 7.0. Provide protection from strong winds to ensure that they grow upright rather than leaning to the side. Rose Daphne do not transplant well once they have become established. After blooming, apply a topdressing mix of peat moss and sand, to help keep the roots cool. Fresh Rose Daphne seeds can be sown in the fall, directly where they are to grow in the garden. Daphne cneorum can also be propagated with softwood cuttings taken in the spring, or by tip layering. producing a cluster of fragrant, pink to red flowers at the end of each branch. The narrow, dark green, 3" leaves are thick and glossy. 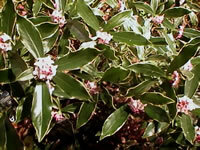 Winter Daphne plants will grow to a height of four feet, with a 6-8 foot spread. Unfortunately, Winter Daphne is only hardy in USDA zones 8-10. It should be grown where it will receive a minimum of three hours of shade each day. Winter Daphne flowers best when it is planted in rather poor but moist, fast draining, porous soil with a pH of 7.0. Winter Daphne plants do not transplant well once they have become established. Feed immediately after flowering, with a good all-purpose fertilizer. Fresh Winter Daphne seeds can be sown in the fall, directly where they are to grow in the garden. Daphne odora can also be propagated with softwood cuttings taken in the spring, or by tip layering. and wait for the roots to develop before severing the new plant from the mother.